Packaged systems simplify the installation process. Installation of these systems typically involves lifting it off the delivery truck, setting into place and connecting the piping and power to prepare it for operation. Single source responsibility simply means there is one company to call if there is a service issue. Issues are solved quickly and end-users eliminate the need to consult with multiple vendors in an attempt to determine which company to call. This ultimately reduces service downtime and eliminates the need to deal with multiple vendors. “One manufacturer means one number to call anytime technical support is needed,” says Municipal Sales Engineer Bob Wedell of Metropolitan Industries who oversees the design and manufacturing of packaged pump systems for the municipal, industrial and commercial markets. Finally, packaged systems are manufactured in a controlled environment which allows for testing of a system prior to jobsite delivery and a reduction of fabrication timelines. This controlled approach minimizes start-up problems in the field and allows for system testing. Packaged pump systems satisfy the demands of many pump industry applications including municipal distribution systems, industrial process systems, non potable and water reuse systems and domestic water booster systems in high-rise buildings. This article will discuss each and share design concepts, common mistakes and best practices. For years, municipalities have relied on water mains to bring treated and disinfected water from the source to our homes, through a distribution network. This network may be comprised of reservoirs, pump stations, water towers and storage facilities. In order to ensure there is clean, drinkable water at an adequate pressure to keep the supply system working properly, water districts employ pump stations that pressurize water to run our household plumbing devices (toilets, sinks, showers, etc) as well as provide water for cooling, industrial needs and also fire protection. These pump stations can be packaged and delivered as a complete unit. Typical designs include a large steel base with pump and control components pre-installed. Base and components are eventually housed in any material of the customer’s choosing. Organizations such as the American Water Works Association help to create standards that are used when designing the various components in such a system. 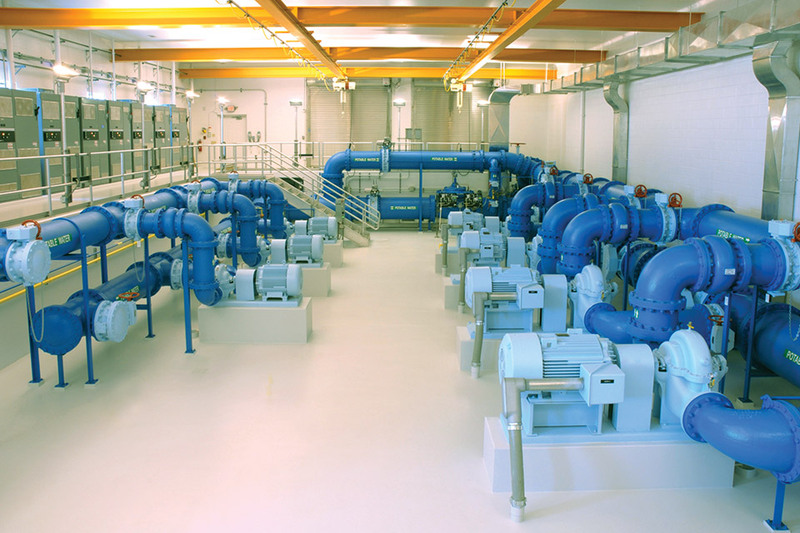 When sizing a packaged pump station for a distribution network, flow and pressure are the two main elements, but there are also many other variables that factor into how a pump system is designed and ultimately operated. The size required varies directly with the number of users or volume of water required and designers will engineer these systems for the total “peak demand” for that segment of the community. For instance, factors such as usage (flow) will affect pump and piping sizing; topography will affect the pressure required; a water tower will also affect pressures and how much water is needed to be stored in order to be able to fight a fire. Monitoring requirements may vary from system to system, but the dynamic nature of the system will make it very important to monitor these changing conditions in order to react appropriately and to prevent these changes from causing water hammer and wide pressure swings which often result in water main breaks. Whether the system is pumping from a reservoir or directly boosting the pressure “in-line” within the piping network, there is a need for pressure and flow monitoring instrumentation required locally and remotely. Motor and valve controls needed at the pump station and level monitoring of towers and reservoirs also directly interface with the pump system. Often times SCADA systems are utilized to collect data and automatically make system adjustments to keep the water pressure constant. They also serve as a means to allow operators to be more proactive in the regular maintenance of the equipment throughout their systems. The bottom line is that whether the system is 50 gallons per minute (GPM) or 25,000 GPM, it is possible to pre-fabricate or package these elements, discussed above, to provide the end-user with a product designed with “complete system responsibility” in mind. Factory prefabricated pumping packages can be applied in many different types of industrial process water applications. Water transfer, level control, recirculation and pressure boosting are just a few examples. Typical skid mounted packages include pumps, motors, valves, package piping, and a factory pre-wired and integrated control system. Specifiers may also consider systems with complete factory prefabricated buildings to protect the equipment and provide a controlled environment in which to perform maintenance and service. It must be noted that there are many important variables to be considered when selecting equipment that’s best suited for these types of applications. Reliability and efficient operation are keys to making the right choices. The properties of the source water and demands of the process must be taken into account when selecting the materials of construction for the pumps, valves and piping. It is imperative that all wetted parts be researched for compatibility and doing so will assure safe and reliable operation. In addition, these types of centrifugal pump applications can often times take advantage of variable speed control strategies. Simplicity, precise process control and maximum efficiency will be realized when variable speed control is specified. Waste water treatment plants will often times have a need for a non-potable water service to satisfy demands throughout the treatment process. For example, wash down water at bar screens, belt filter presses, yard hydrants and clarifier spray water can all be served with a non-potable source. Reuse water reclaimed from the final effluent of the plant can serve as the source for these non-potable demands as well. Potable water mains are also a choice to supply water for these applications but it is important that the potable water source be protected from cross contamination. When back flow protectors are not allowable, protected water systems often times employ an air gap break tank to effectively decouple the non-potable loads from potable water mains. Seal water systems requiring a source of clean water to pressurize stuffing boxes on large sewage pumps is another example where an air gap protected potable water source can be utilized. Many different types of pumps are suitable for these types of applications. End suction, vertical multi-stage, vertical turbine and split case pumps are all sound choices. Selecting the pump that’s best suited is a matter finding a unit that’s a good hydraulic fit, simple to maintain and of course efficient to operate. Factory prefabricated pumping packages are available for both water reuse systems and protected water systems. Typical packages would include pumps, motors, tanks, package piping and controls. Recirculation circuits, valve subsystems and safeties make for a complete integrated package. When the water pressure provided by any given municipal water system is not sufficient to satisfy the demands of end-users at higher elevations such as mid-rise or high-rise buildings, it is often necessary for these facilities to have equipment within the structure designed to increase the pressure provided by the municipal water systems that are ‘horizontal’ in nature. These types of prefabricated systems are engineered to satisfy the potential peak flow demands of the facility and are often provided with multiple pumps on a single structural steel fabrication with electronic controls, wiring, piping, valves, and multiple safety-devices. These packaged systems are typically designed based on the calculated increase in pressure required to deliver pressurized water to the highest or furthest point-of-use in the facility. Many times multiple electronic sensors are installed at remote locations within the facility. These sensors allow the controls to optimize the operation of the system, and also enhance the energy-efficiency of the equipment. In certain regions of the country, the design requirements of these types of systems are regulated by local, national, or international code requirements. This article discusses the benefits associated with packaged pump systems, which are ease of installation, single source responsibility and streamlining of the manufacturing process. This can be applied to the municipal, industrial, non-potable, water reuse and domestic water booster system markets. Regardless of your application requirements, Metropolitan has the capabilities to design and assemble a customized solution that adheres to unique job site specifications. With our single source responsibility, our project partners and end users can trust that their made-to-order system will provided sustained performance that exceeds expectations. With our engineering prowess and in-house fabrication capabilities, there is virtually no limit to our factory prefabricated pumping package selection.